Pressure gauges have various types and usage, and one of this was a differential pressure gauge. A differential pressure gauge is not just used to measure and display a pressure reading but it is also used as an instrument to measure the level of a liquid specifically in gas industries (cryogenic). 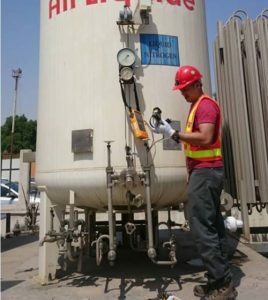 It is used to measure the level of a cryogenic liquid like Liquid Oxygen (LOX), Liquid Nitrogen (LIN), Liquid Argon (LAR) and others, whether in a storage tank or in a transport tank. These are usually in an enclosed tank. how to read a level gauge with multiple displays. Some differential pressure level gauge has a 3 different displayed unit with a varying range. This is confusing if you are not familiar with it. Me, during the calibration of a DP level gauge. This post will focus only on the analog type differential pressure level gauge for simplicity. How does the Level of Liquid is Determined by the Differential Pressure? The height or level of a liquid in an enclosed tank can be determined by the differences of two pressures (the high and low side) divided by the specific gravity of the liquid. That is why we are using a differential pressure gauge as the instrument for this job. This is also applicable to an open-end tank or vessel. The formula below explains how a level is computed when a delta P (ΔP) or differential pressure is available. Formula 1: Pressure level calculation when Pressure and Specific Gravity are given. Based on the above equation, we can see that the pressure is dependent on the liquid density or its specific gravity when in use, so different kinds of liquid gas even though they have the same level value will display a different pressure. It is important that we should determine first the kind of liquid before we can take the exact value of measured pressure with an equivalent value of level. The displayed units we normally encounter are the pressure units which are the mbar or the mmH20 which is also equal to mmWC. Others are directly displayed as percentage % units, volume in Liters, or fraction format to show the actual level, some are in a combination of the two. See photo below. This kind of units or display is very usual and understanding them is very simple. But what if the display are different, in LOX, LAR or LIN? 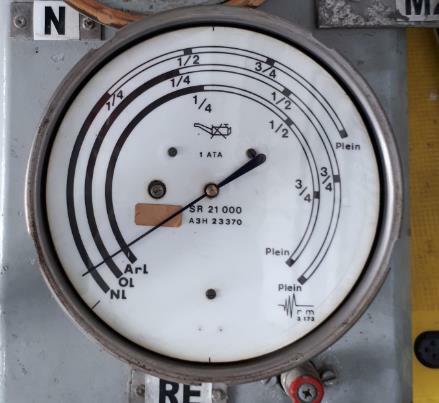 There are also Level Gauges that display only a pressure unit in LIN, LOX or LAR ( also known as ArL, OL, and NL) which has an equivalent pressure value depending on the liquid content of the storage tank. 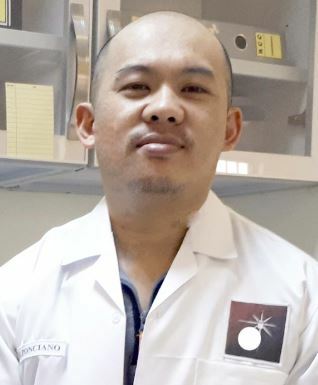 Actually, this is not a pressure unit, but the name of the liquid gas used, namely, Liquid Oxygen (LOX), Liquid Nitrogen (LIN) and Liquid Argon (LAR). Others are CO2 or 02 which are the ones we normally see. The main unit that is being used is the percentage (%) and it has a pressure value counterpart in mmH20 (mmWC), mbar or in other pressure units. 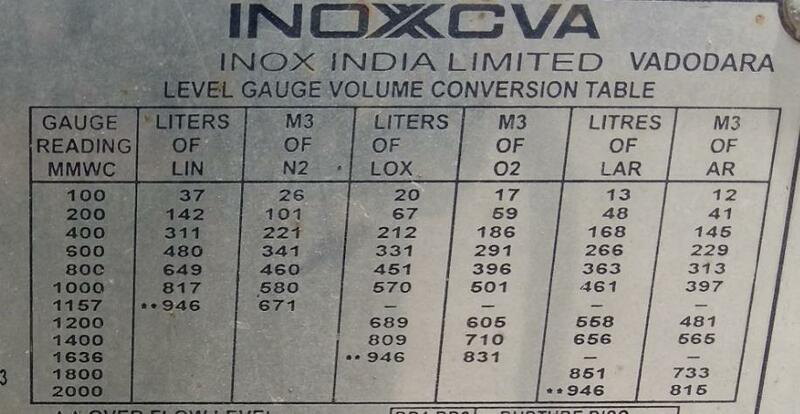 Some level gauge also has a unit of volume, which is in Litre. Have you encountered a Differential Pressure Level Gauge with multiple ranges or type of liquid gas it can measure? There is also a level gauge with 3 displayed range or fluid gas used in one face of the gauge with a fraction as its scale division. It may confuse you at first (because it did to me) on its many displays. See below photo. Some level gauges have no pressure units, only the fluid that is being used. Also, some pressure level gauge displays only the full range value of its pressure. 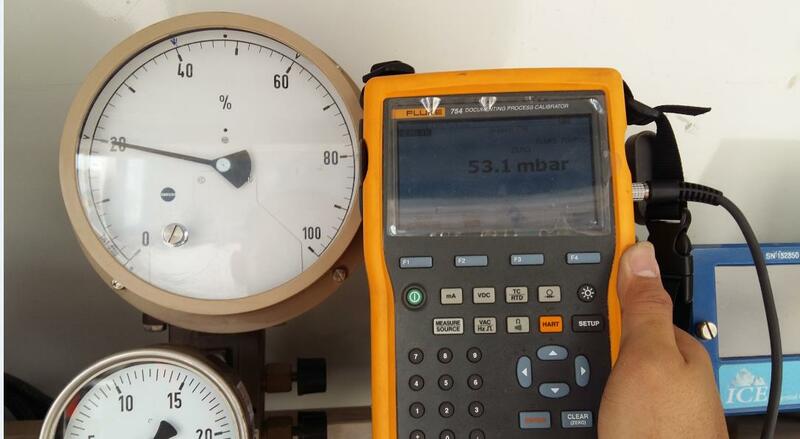 This is why it is important to have in hand the specifications of the tank where it is being used before calibration, in order to determine the pressure displayed versus the equivalent level. This is provided by the manufacturer or supplier of the instruments used. There are conversions or equivalent pressure value that we need to know in order to understand it. Below is a sample conversion or reading from manufacturer posted on the storage tank. You should be aware of these specifications because not all storage tanks display this information. How to Read a Differential Pressure Level Gauge? There are so many types or model or manufacturer of a differential pressure gauge and I will share in this post the one that I encounter and hopefully, it will be a great help to you. I will first introduce the level gauge with a simple pressure to the percentage (%), volume, or direct pressure equivalent reading (see Figure 1 above). These type of Level gauges have a readout display that is directly converted to level. An example is a percentage (%) which means that at a full range of pressure generated equals a 100% level. The unit of measurement it is being used and their equivalent conversion units. The user ranges if available. By having this information readily available, recording calibration data points can be achieved easily. 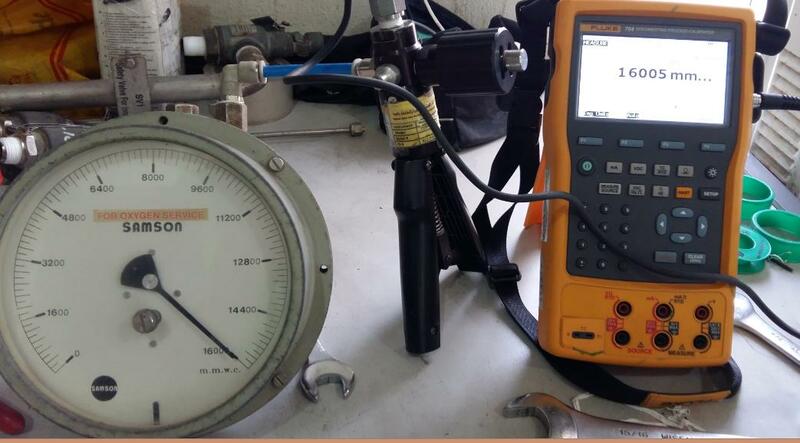 We will calibrate the level gauge by using Fluke 754 with a pneumatic pump and a Pressure Module as our reference standards. Calibration of this type of a level gauge is exactly the same as a normal Differential Pressure Gauge as long as it is detached from its location and manifold and thereby directly accessing the input (+ side) of the differential level gauge. 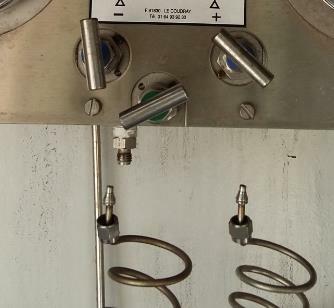 As explained above, the level is dependent on the specific gravity of the liquid gas that is in use, but during calibration, since we will isolate the level gauge by closing the valves on its manifold or simply removing the level gauge itself, we will use the air (oxygen) as a medium or fluid for calibration or for generating pressure. The process of reading is still the same as the normal display units above, the only difference is the liquid used. During calibration, we will neglect the liquid gas setting displayed in the unit and substituting 1 as the specific gravity for every pressure value we have (see formula 2 above). 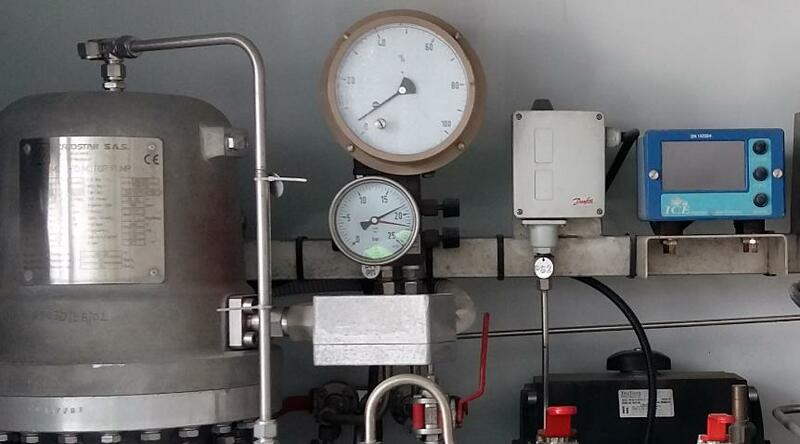 The level gauge output display in this process act as a normal level or differential pressure gauge (unless you use the exact liquid gas they used). So the calculation of level in terms of specific gravity is not needed. In this part, I will share with you how to set up and isolate a differential level gauge with a manifold. Most level gauge of this type when calibrating on-site or in its location, it is integrated on its manifold and cannot be detached, in this regard, an additional step must be followed in order to properly measure or calibrate the unit. One must be familiar in the opening and closing its isolation valve in order to achieve the correct reading. This is very tricky when you are not familiar with its manifold. You may also damage the level gauge when a sudden rush of pressure is encountered. a simple demonstration on how to perform differential pressure level gauge zeroing and calibration set up. 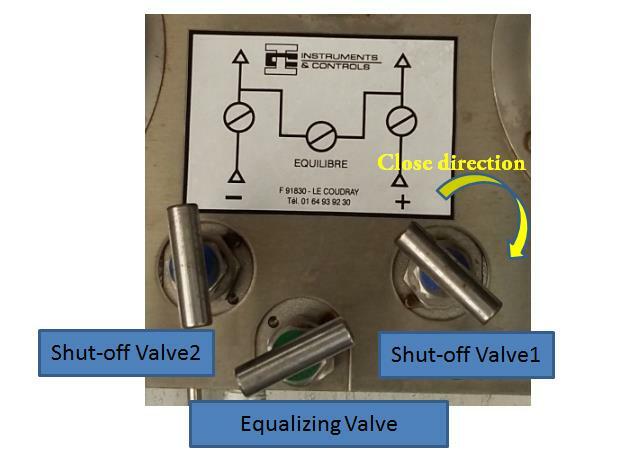 Before performing the calibration, close all valves with pressure going to the manifold and execute the procedure below (See figure) to prepare the level gauge for calibration. There are different designs of manifolds (as you see above) but the valve operation is the same, so don’t get confused with this. Close the high-pressure shut-off valve1. Close the low-pressure shut-off valve 2. In this status, the level gauge pointer must also be in Zero position. It is now ready to be calibrated. If not in zero position, perform an adjustment. Read further below. The Set-up for a pressure level gauge that is removed from its manifold is also the same as a simple differential pressure gauge so the connections are also the same. 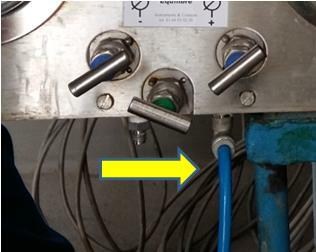 In the case where the Level gauge is detached on its manifold, we will just locate the positive side of the level gauge and connect the input pressure of the reference standard. See below photo. A dedicated calibration port is included in most Differential Pressure (DP) level gauges for ease of calibration without removing the unit from its manifold or assembly. This makes calibration or verification much easier and faster. You just need to isolate the unit from the pressure source then Perform the “Zero Setting” procedure presented above. Zeroing will also Isolate the DP level gauge. 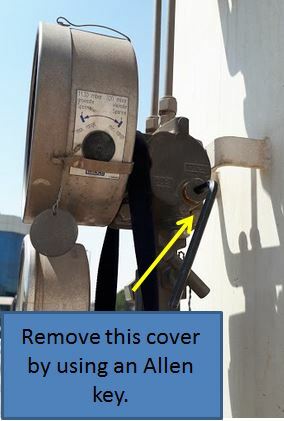 Once Isolated, remove the seal of the DP level gauge on its side (right side when facing the unit). it has (+) sign in it. See below photo. DP Level Gauge calibration port. Removal of the screw with a hexagonal socket by using an Allen key. There is another seal in the left, the (-) port, just loosened it, no need to remove. 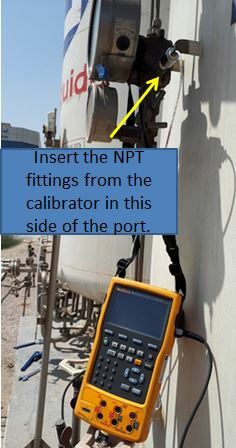 Then insert the NPT fittings of the calibrator on the positive port (+). Make sure to close the equalizing valve. You are now ready for calibration. See below set up. Positive port for the supply pressure from the calibrator. When manifold is included, you need to follow an additional procedure. After performing the preparation and zero-check procedure above, it is now time to connect our standard for calibration into the manifold. Follow below steps. Ensure that the manifold is Isolated from the supply. Remove all the fittings or connected tubes in the manifold input. Close the equalizing valves, in this status, the level gauge should be in zero position because the pressure in the positive and negative are exposed to ambient and therefore equal. Connect the port of the calibration pump on the positive side of the manifold. Manifold connected to reference standard output port. You can now start to pump and generate pressure. Generate pressure in an increasing manner until you reached the full scale. This will only require a small pressure so pump very slowly and not to damage the level gauge. Then slowly release the pressure and get the reading. Same set point but in a decreasing manner. Repeat the process two times. Record all readings in your Measurement Data Sheet. After calibration and everything is returned for operation, follow the procedure for “Preparation Before Calibration” but in the reverse order. This will ensure that the level gauge is protected from a strong surge of pressure that can damage the unit. Open the low shut-off valve2. Slowly open the high shut-off valve1. It is now ready for testing or operation. First, use the designated zeroing port. If this fails, perform below, see photo. Open the level gauge housing. Locate the screw, use an Allen key to turn. (Some unit has Allen key included in the unit). Slowly turn clockwise or counterclockwise depending on the offset you need. Remember, Use only a very small force, this is very sensitive. Perform another calibration to check the reading. SAMSON Level Gauge Adjustment using the provided Allen key – insert the Allen key into the dedicated port then turn it very slowly. I have presented what I believe the important aspects during maintenance or calibration of a differential pressure level gauge. 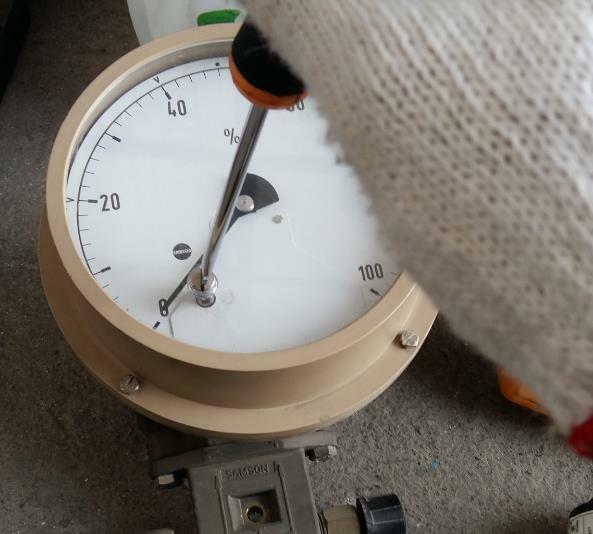 We have discussed the principle on how a differential pressure gauge can measure a level that is dependent on the density of the liquid, I have shown you the different types of level gauges display and explained how to understand them, presented the calibration set up, zeroing, and the procedure. I hope that this could help you in your level gauge calibration. Thank you for visiting my site, please leave a comment, share and subscribe. Very good article. I hope there is a book or eBook for this. Thank you and God bless. I appreciate you liked the article. Thank you for visiting my site. Yes, I will consider creating an ebook for this.